Baby Update | 27 Weeks! And this week, ladies and gentlemen, ends my second trimester. How is that possible? 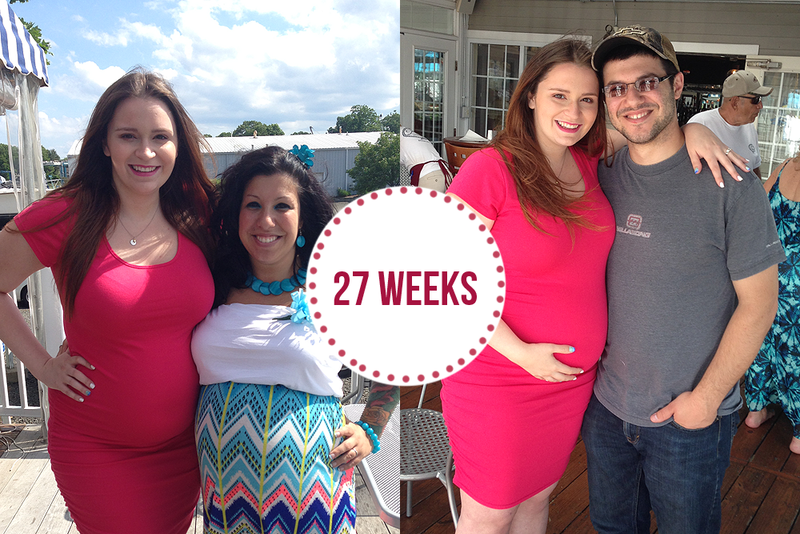 This week, Baby XO is the size of a cucumber, about 15 inches long and weighing 2.5 pounds! According to my phone app, I have 12 weeks and 6 days left. I'm trying not to freak. How far along? 27 weeks and 1 day. My last week before I go into my third trimester! Maternity clothes? Heck yes. I've been loving my Old Navy dresses like the one above. So comfy! Stretch marks? A few small ones still. Sleep: Pretty well. Knock on wood. Although it's been getting hot at night and no matter, I can't seem to cool down. Miss Anything? Not too much. Movement: Lots! I can't wait until it's more consistent though. Food cravings: Nothing crazy but I've been loving iced coffees. Yummmm. Oh and Coldstone Creamery! Symptoms: Pain under my ribs if I sit too long, stretch marks. I consider myself lucky! Happy or Moody most of the time: Feeling super relaxed! Looking forward to: Our baby shower! Invites are starting to pop up in mailboxes and I can't wait! I'll definitely show you guys more about it when well, we get more. LMAO. This is so fun! You look gorgeous...glowing!